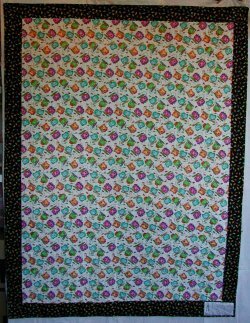 I had been collecting cat motif fabric for about 2 years with the intent of making a cat quilt for Helen, one of my far-flung computer friends. I wasn't sure exactly what design I was going to be using, so I just bought "appropriate" amounts as I found the fabric. :-) It wasn't until the Fall of 2000 that I found the "sushi cat" border stripe (made of 2 different stripes) and coordinating print. Since Helen just loves eating fish bait [vbg] and has 2 cats of her own, I knew that the sushi cat border stripe was *perfect* for her. After bookmarking many potential layouts shown in magazines and books, I decided on a vertical/column quilt .. alternating vertical columns of the sushi print and flying geese of the cat motif fabrics. The sushi columns are cut from one part of the border print. The background of the flying geese is tan-colored with brown paw prints. 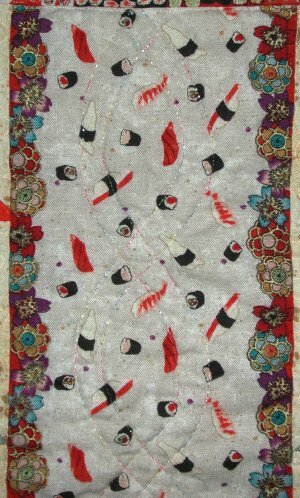 The outer borders of the quilt are from another part of the sushi border print. A problem arose when it came time to put on the outer borders. I had purchased the border stripe well before I had a design in mind, so that I was limited to the yardage that I bought, which was 2 yards. 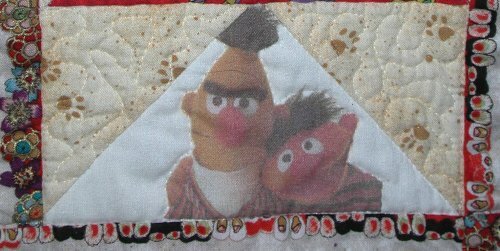 This wasn't enough to do mitered corners, which I think would have been the best way to do the corners for this quilt. In fact, I was doggone lucky to get the borders that I *do* have! So, I was faced with the problem of what to do with the corners. Fortunately, I had some of the coordinating all-over cat design fabric, and I cut out cat motifs from that. There are 2 special flying geese blocks. Helen is owned by 2 cats, Bert and Ernie. I obtained a Sesame Street image of those characters, printed it onto white fabric and made a flying geese block with them. Helen is a *very* intelligent lady, having earned her doctorate in biology-something-or-other before she was 26 years old and holds a research job in a very competitive, generally male-dominated field. The back of the quilt remained a puzzle until I found the PURRFECT fabric at a quilt show. Since the quilt top was wider than 45", I had to augment the computer terminal print to make it wide enough. 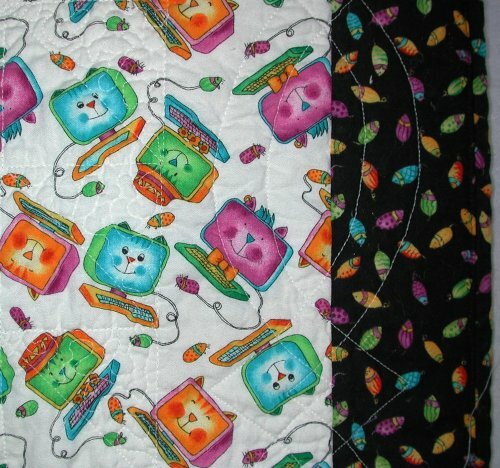 I didn't want to just put on vertical borders this time, as I had done that on many previous quilts, so I decided to "frame" the computer terminal cats with the computer mice fabric. 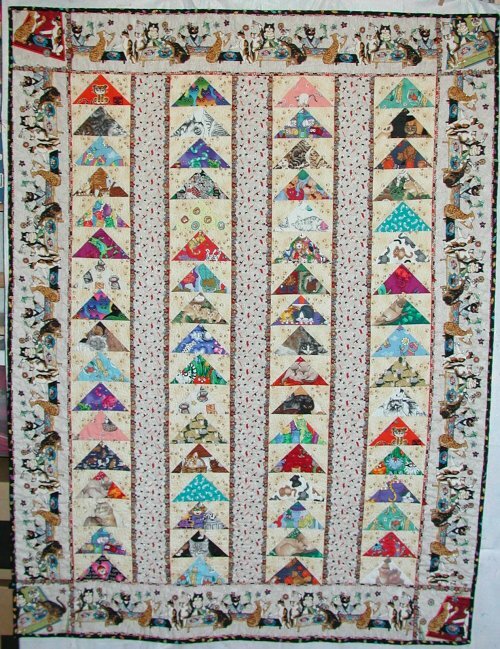 The entire quilt was bound with double-fold binding made of the computer mice material. For the quilting .. which I am pleased to say I did myself! .. I stippled the background of the flying geese with clear monofilament thread. I must admit that stippling is a stressful technique for me, as it requires you to do a "nicely random" design. [sigh] I don't *do* random nicely. [sigh] But, I suppose with enough practice, I'll become better at it. The sushi print columns were quilted in a simple double-line cable design, stitched in a holographic, rainbow-hued fiber, which kinda/sorta looks like the rainbow shimmer of an oil slick on a roadway (not a terrifically great image to think about, but it does give you the effect) :-) The sushi cat borders where quilted in the same holographic fiber, again with a double-line cable but this time with a diamond motif between the cables. The corner squares were outline quilted in clear monofilament.